Our screening went fabulously last night with a full house! The School Zine does an interview with one of the filmmakers on the red carpet. The filmmakers with Lia and Amie. Our screening is tomorrow night and preparations are being made. The red carpet is ready and awaiting the 12 young first time filmmakers. Copies of the films will be on sale on the night for a bargain World Premier price!! 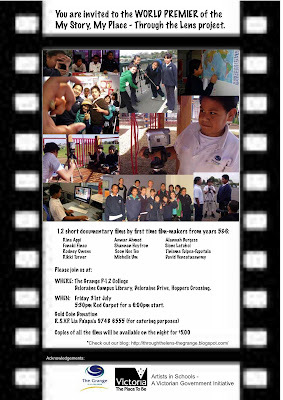 World Premier of 12 short documentaries by year 5 & 6 students from The Grange P-12 College. 5:30pm Red Carpet for 6pm Start. WHERE: The Grange, Deloraine Campus Library, Deloraine Drive, Hoppers Crossing. WHAT: Films, Food and Celebration! Students are now hard at work putting their films together. There are many decisions to make in terms of music, sound effects, narrative etc. Some of the high school students have come in to help out with recording original music. One student is even doing an animation. This means drawing, drawing, drawing - scanning, scanning, scanning! Some of the students are creating the music for their films on the computers. Excursion time.... what fun to be had and so much to learn about filmmaking! We went along to Little Big Shorts, a film festival especially for kids. The students enjoyed a program of short films from The Netherlands, Bangladesh, USA and Australia. We were lucky to have one of the filmmakers, Tali Ga-lon in the crowd. Students had an opportunity to ask her about her animation Lucille. Some students took the opportunity to get some shots for their films. 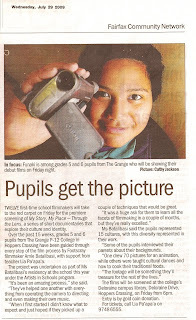 The local newspaper, The Werribee Banner, came to see what we are up to and take some photos of the students at work. Production has started which means filming, dancing, eating, interviewing.... Parents have come in for interviews and also brought some special cultural foods. The students' stories of culture and identity are starting to unfold. Melbourne filmmaker Amie Batalibasi will be undertaking an Artists in Schools residency at The Grange P-12 College in Hoppers Crossing working with a group of twelve year 5/6 students. The project will use the medium of documentary film as a form of storytelling to explore the themes of culture and identity. With assistance from Amie and teacher, Lia Pa'apa'a, the students will develop an idea for a documentary film that addresses these issues. 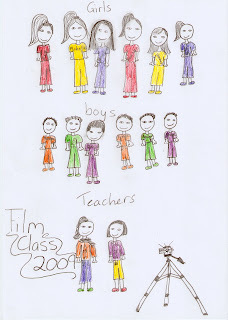 Then throughout Term 2, 2009 the students will work in film crews to produce a short documentary from the initial pre-production planning right through to editing and post-production. 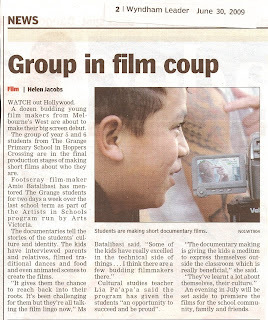 The result will be a series of short films that will be shown to the school and the broader community at a public film screening. Amie's work is centered around documentary films that emphasise storytelling about human rights, social justice issues and cultural diversity. Through her filmmaking practice she is interested in provoking thought and discussion within the community about these issues. She aims to produce documentary films that are engaging and provocative by interacting with people and communities at a grassroots level, to unearth stories that encourage audiences to think beyond the realm of their loungeroom, office or cinema.